Remember 10 years ago when the Red Sox were a cursed franchise with tortured fans who were destined to never see another World Series title? It wasn’t that long ago but it certainly feels like it after the Red Sox clinched their third World Series in the last 10 seasons on Wednesday. Just last year they were a 93-loss team in the cellar but it didn’t take long for them to return to the penthouse. The outcome of Game 6 was never in doubt. Rookie phenom Michael Wacha couldn’t continue his postseason magic and Victorino delivered with the bases loaded again. Boston built a 6-0 lead and never looked back. David Ortiz had a World Series for the ages, hitting over .600 and earning the World Series MVP. Congrats to the Red Sox and their fans who got to enjoy a World Series victory at Fenway Park for the first time since 1918. I’m a Mets fan but I’ve always respected Boston’s passion and that historic “lyric little bandbox of a ballpark,” as John Updike would say. 95 years is a long time and the energy in that ballpark last night was electric. Fenway Park was the center of the sports world and Boston fans have a night that they will never forget. The Red Sox have to be considered the team of the 2000s – they’re the only franchise with 3 World Series titles since the turn of the century. While that might make Yankees fans sick, I didn’t have a much of a problem with the way things turned out last night. I sat and watched the game from the exact same seat that I sat in 6 months earlier during the Boston Marathon bombing. Back then, I watched in shock and disbelief as a manhunt unfolded live on television, holding a city hostage. Last night, I watched that same city and its people come together to celebrate their beloved Red Sox. It felt right to watch the city rejoice – the emotion was palpable through the television. The Red Sox winning the World Series doesn’t change the fact that the bombings happened and it doesn’t fix the lives that were ruined by the senseless act. But it does give Boston a reason to celebrate their city’s resilience and strength. Sports has a way of bringing people together and taking on a greater significance. The way the players, owners and GM addressed the fans after the game confirmed that fact. The Yankees deserved the same fate in the 2001 World Series following the September 11th attacks and although they didn’t win it, just competing in that World Series was a cathartic and emotional experience for the city. “Boston Strong” was born out of a terrible day in April but it became the motto of a city and its baseball team. The Red Sox have always been there to bond the people of Boston together and it was very cool to watch everyone revel in a World Series title. It was a fantastic postseason with many memorable moments and in the end, I think the best team won it all. Next year is a new season but 2013 will forever be about Boston’s worst to first turnaround and Boston Strong. I just discovered HAIM thanks to ALT Nation on Sirius XM and The Wire is an infectious song that has been impossible to get out of my head. The band consists of three sisters from Los Angeles ranging in ages from 22-27. They’ve got a great alt-rock vibe with some hip hop/R&B style mixed in and they’re signed to Jay-Z’s label ROC Nation. Good on HOVA for recognizing a unique sound and yes that is Jorma from The Lonely Island in the video. There should be more good things to come from HAIM but in the meantime try getting The Wire out of your head after your first listen. It’s impossible. “I don’t even know what happened actually.” – Carlos Beltran. That’s coming from a guy in his 16th year in the league who just played in his 48th postseason game of his career. Beltran’s been around the game for a while and he’s never seen an ending quite like the one at Busch Stadium on Saturday. In fact, in the 108 previous World Series in baseball history, no game has ever ended like Game 3 on the 2013 Fall Classic. That’s what makes baseball (and sports) so special. You can never predict what is going to happen. An obstruction call is a tough way to decide a game but I do believe it was the right call. Based on Rule 7.06, the runner was obstructed from running home, whether Middlebrooks meant to do it or not. The call was also made right away at third. Like I said, it’s a tough way to decide a game, especially one as fantastic as this one, but rules are rules. 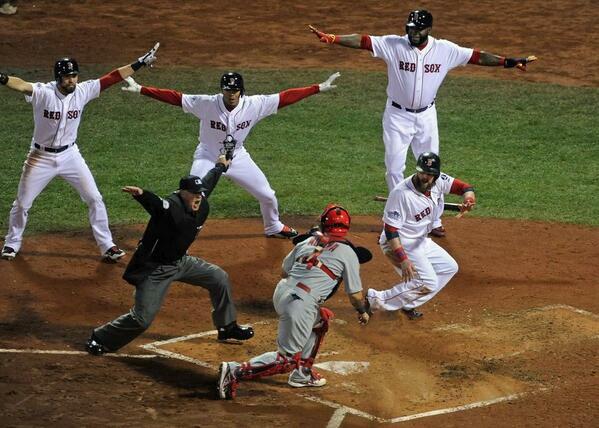 After the call, chaos ensued as the Red Sox came out to argue while the Cardinals celebrated. Fans in the stands didn’t even know why their team had won. Without a doubt, it was one of the most bizarre endings to a game that I’ve ever witnessed. The Red Sox have now lost 2 games in this series thanks to errant throws to third base. While the obstruction call stole all of the headlines, this game was so much more than that. The biggest takeaway for me is that John Farrell got completely outmanaged by Mike Matheny. He was completely in over of his head dealing with the pitcher’s spot in the order and he ended up leaving Napoli on the bench for the entire game. Meanwhile, he let a relief pitcher hit in a tie game in the 9th, only to take him out after 1 out the following inning. Farrell also admitted that he should have double-switched Saltalamacchia out for David Ross when he brought in Workman. Those mistakes are inexcusable and they played a large role in the Red Sox losing the game. Baseball is exponentially more fun in a national league park, at least for me. The absence of the DH complicates things and it requires so much more strategy and forethought. It’s like playing chess while the other manager is playing checkers. Farrell’s inexperience with the National League style of play hurt the Red Sox big time and he needs to figure it out fast or this series will never make it back to Boston. Both teams now have to put the obstruction call behind them and focus on Game 4. You can bet that tonight’s game will be just as close and intense. This has been a fantastic World Series to cap off a phenomenal postseason and the rest of this series is going to be electric. 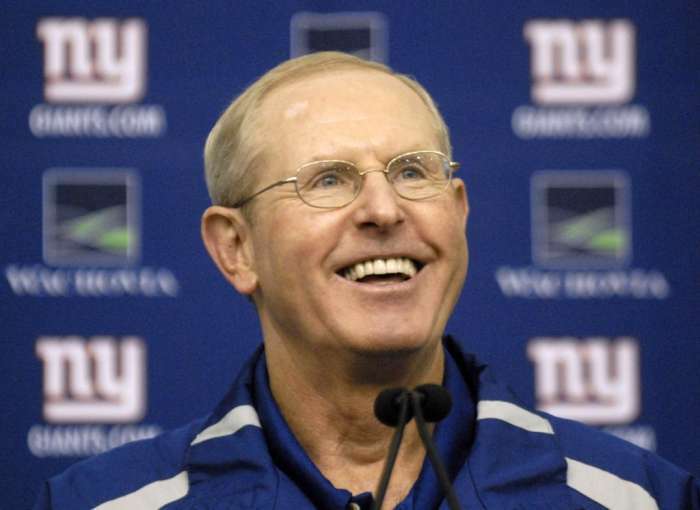 E:60 does some great work and it continues with a piece on Tom Coughlin that aired tonight. A Syracuse grad and 2=time winning Super Bowl coach, Coughlin’s story is one worth telling. He is a good role model and a reminder that awareness of your surroundings coupled with a small adjustment can take you a long way both personally and professionally. I can’t find the video anywhere online, but I highly recommend it and I’ll post it as soon as I find it. This is easily the most upset I’ve ever been over a waiver claim. Mike Baxter will always have a place in Mets history. 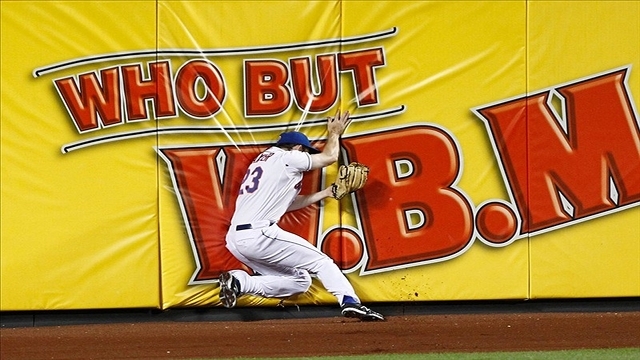 His amazing running catch in left field to preserve Johan Santana’s no-hitter is something that I will never forget. I still get chills thinking about the play and the elation I felt when I realized he had made the catch. One memorable play doesn’t earn you a lifetime roster spot and as the business goes, Baxter heads to the west coast. But from here until the end of time, Mike Baxter’s name will always be associated with the 1st no-hitter in Mets history – something that took the franchise 50 years to achieve. Good luck in LA, Mike and thanks for such a memorable play. Mike Baxter gave up his body to preserve Johan Santana. 's no-hitter. Always will have a place in Mets history.First class person. The best. People actually think Eli should be benched? I recently stumbled upon an article on NJ.com titled “POLL: Should the Giants bench Eli Manning?” So, I took the poll answering No and the results popped up. 59.87% said Yes, Eli Manning should be benched. Give me a break! There were 461 votes cast so this is far from a substantial sample but the fact that 276 people answered Yes really irks me. What good will benching Eli do? The team’s 0-6 start does not fall only on him. He has not played well this season but the team has much bigger holes to fill than at the quarterback position. The issues at offensive line, running back, linebacker and in the secondary way overshadow any problem that Eli Manning is currently presenting. Some say to bench him so that he doesn’t get hurt during a lost season. C’mon, the guy has started every single game since being named the starter back in 2004 (there’s the kiss of death). Believe it or not the Giants season is not even over yet thanks to the rest of the division being almost as mediocre through the first 6 weeks. If you are seriously considering that Eli needs to be benched, then you have truly run out of things to talk about. Who knows who even participates in these polls but hopefully there are more people out there who realize that benching our franchise quarterback is counterproductive. 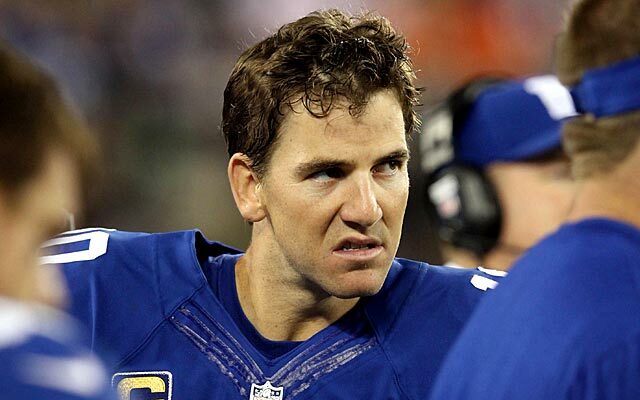 Eli’s thrown a lot of interceptions this season but at least half of them were not even his fault. Manning is the leader of the team and if the team isn’t performing, it’s on him to fix it. He can’t do that from the bench. Both Eli and Coughlin have carte blache in my book. It’s very hard to win in the NFL and they won 2 Super Bowls in a 4-year period. Anyone who is calling for their ousters after 6 games needs a reality check. The Giants take on the Vikings on Monday Night Football this week. If nothing else, a win would be nice to get off the schnide and end this useless chatter about benching Eli Manning. I saw someone cover Use Me by Bill Withers on The Voice and it reminded me of what a great song it is. It’s such a smooth tune and that funky groove always puts me in a good mood. Trending high on my music radar right now is soul music in general, especially Bill Withers and Al Green. Those guys had some hits and they sound just as fresh in 2013 as I assume they did in the mid 70’s. In searching for these types of songs online, I stumbled on some stellar YouTube covers of Use Me, highlighted by this father-daughter masterpiece. Sometimes it really amazes me that there is so much undiscovered talent. There are a lot of really good singers out there and maybe this girl will go on to super-stardom but as of now, I’m willing to call this one of the best YouTube covers I’ve ever heard. Kudos to this girl and of course to Withers for creating a fantastic song.